Without a scope ring or adapter that fits properly, even the very best scope and rifle combination could be rendered useless. Don’t wait until you get to the range or out in the field to find out you have a weak or ill-fitting scope ring or adapter. 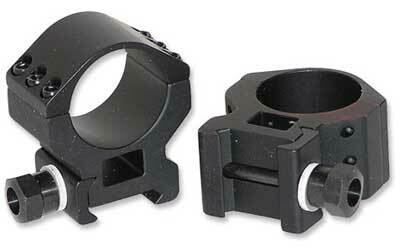 GrabAGun’s wide array of scope rings and adapters are available in a multitude of styles and designs. It is imperative for the success of your shooting excursion that you have the correct size and security in your scope ring and adapters on your gun. Get a sturdy, solid grip around the scope and a tight fit on the rail. Choose from Weaver, Picatinny, Leupold, and other bases that allow for interchangeability between gun manufacturers. A Weaver style ring can be used for an easily detachable wraparound style for simple adjustment. Larger, heavier Leupold fits are not as easily detachable but form a tight, strong, sleek fit and higher durability against the elements. The selection available from GrabAGun includes scope rings made of lightweight aluminum, steel, and other materials in varying colors and heights for high performance based on your level of activity and the ruggedness of your gun. Reliable brands such as Simmons, Traditions, and NCStar provide quality you can count on to help you fully enjoy your time at the range or in the great outdoors without having to worry about minor—or even major—adjustments that inhibit your experience.